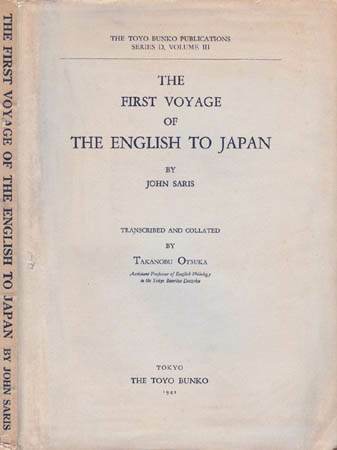 The First Voyage of the English to Japan by John Saris, Transcribed and Collated by Takanobu Otsuka, The Supplementary Volume to the Toyo Bunko Sokan, No. 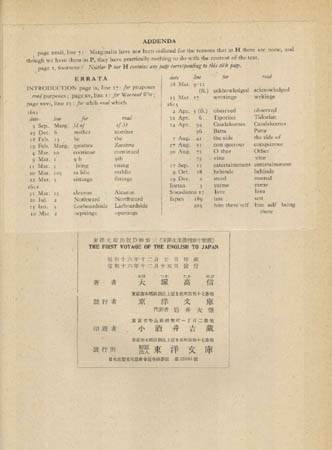 10, The Toyo Bunko Publications, Series D, Volume III, Tokyo, The Toyo Bunko (The Oriental Library), 1941, 8vo (7 1/4 x 10 1/8 in - 18.3 x 25.8 cm), paper wraps, addenda tipped in at rear, 266 pp. This book supplements the 1940 Toyo Bunko book (see 1940, above) which is a facsimile of the Saris journal owned by the Toyo Bunka. This book is a transcript of the Saris log owned by the Toyo Bunko (called the "Brown MS". 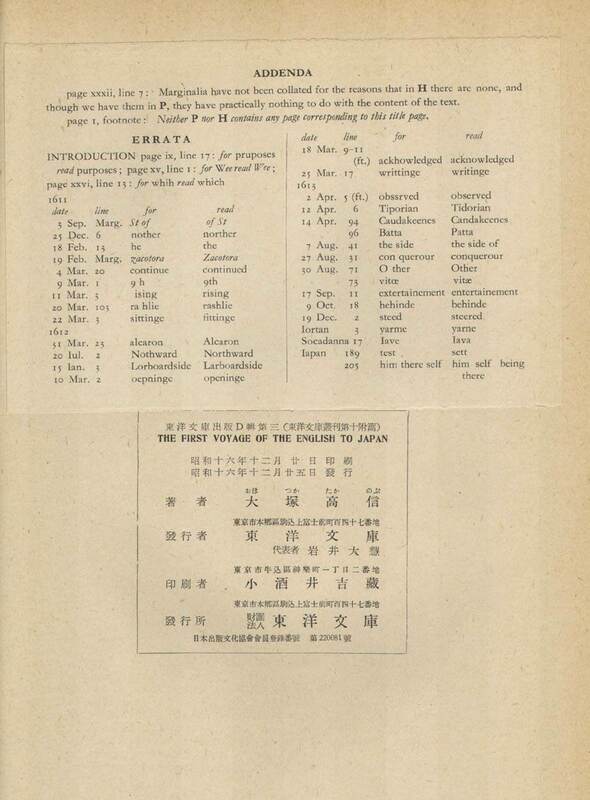 Two other variants of the log were previously published ("P - Purchas" version and "H - Sir Ernest M. Satow's" version). These two are collated with the Toyo Bunko's version. The collation is made in footnotes at the end of each page. This book is an important supplement to the original facsimile of the "Brown MS" published by the Toyo Bunko a year earlier. 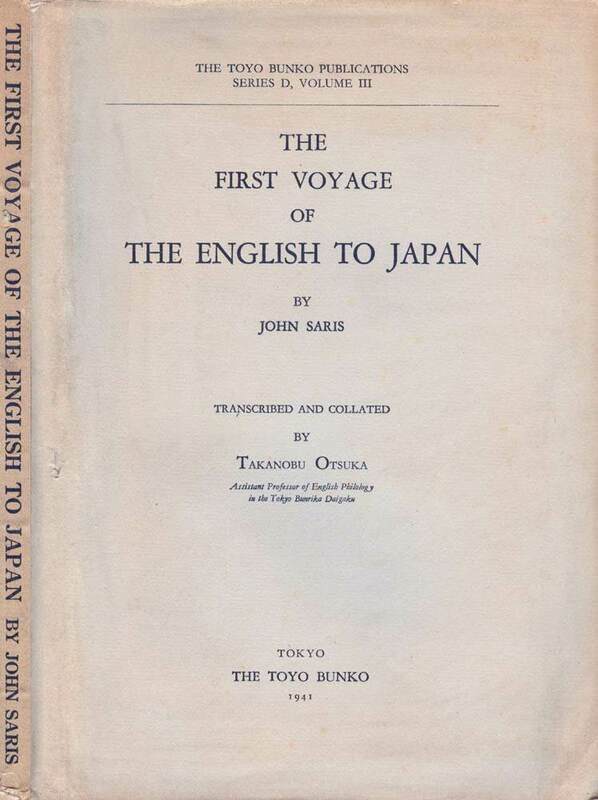 1940, The First Voyage of the English to the Islands of Japan, Being the Eight Voyage of the East Indies Under the Command of Captame John Saris of London with The Ships the Cloue and the Hector and the Thomas, Toyo Bunko, facsimile of Saris's log in collotype. See below. Brown Manuscript ("Brown MS"). An original Saris's manuscript version of his log which was purchased by the Toyo Bunko in the 1920s. Published in facsimile form in 1940 and transcribed in 1941. 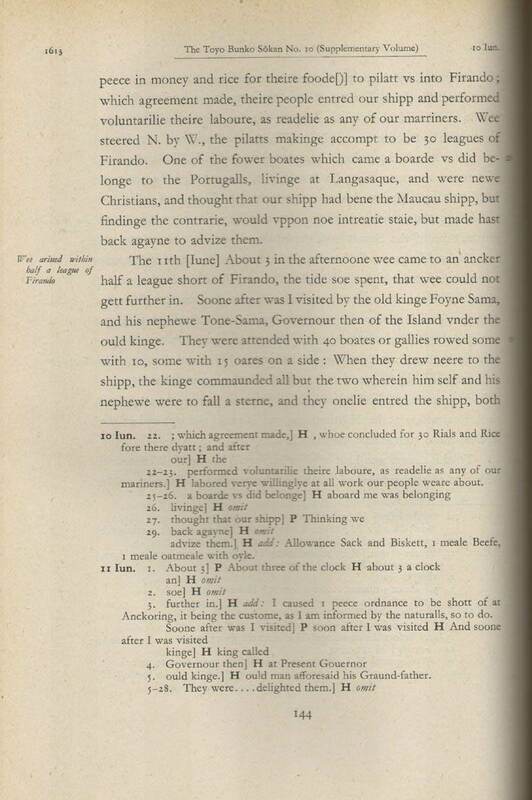 The First Voyage of the English to the Islands of Japan, Being the Eight Voyage of the East Indies Under the Command of Captame John Saris of London with The Ships the Cloue and the Hector and the Thomas, 1940, Toyo Bunko, facsimile (reproduced in collotype) of the "Brown MS." More information here. 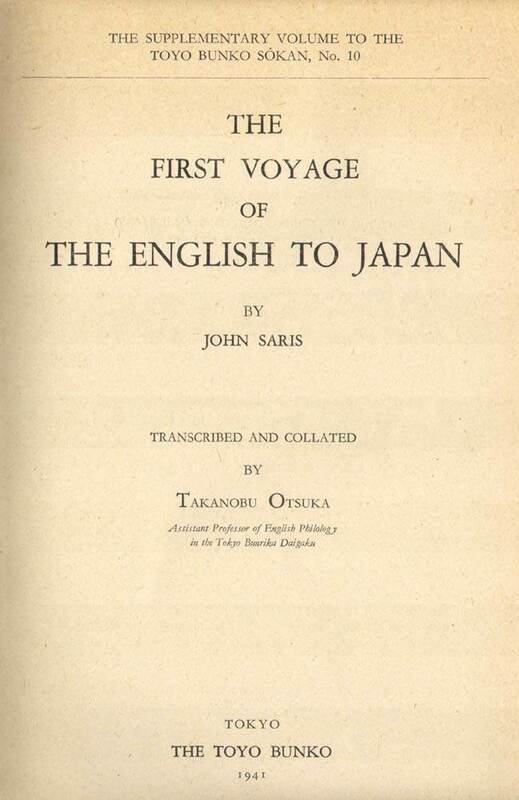 The First Voyage of the English to Japan by John Saris, Transcribed and Collated by Takanobu Otsuka, The Supplementary Volume to the Toyo Bunko Sokan, No. 10, The Toyo Bunko Publications, Series D, Volume III, 1941, Toyo Bunko, transcript of the "Brown MS." More information here. Hakluyt Version of the Log. This is not a manuscript log. Hakluytus Posthumus or Purchas His Pilgrimes, Contayning a History of the World in Sea Voyages and Lande Travells by Englishmen and Others . Samuel Purchas (1577-1626) inherited the papers of Richard Hakluyt, a noted travel writer, who died in 1616. Using these papers, Purchas published this 5 volume set in 1625 in London. This set contains a copy of the Saris log which was apparently taken by Richard Hakluyt directly from Saris's personal copy of his log. Hakluytus Posthumus or Purchas His Pilgrimes, Contayning a History of the World in Sea Voyages and Lande Travells by Englishmen and Others, 1905~7, Glasgow, James MacLehose and Sons, Hakluyt Society, a 20 volume reprint of the 1625 five volume set. Volume III contains the Saris log. More information here. Purchas His Pilgrimes in Japan. Extracted from Hakluytus Posthumus or Purchas His Pilgrimes. Containing a History of the World in Sea Voyages and Lande Travells by Englishmen and others by Samuel Purchas, B.D. and edited with commentary and notes by Cyril Wild, Kobe, J.L. Thompson and London, Kegan Paul, Trench, Trubner & Co. Ltd., 1939, printed in Japan by The Kobe & Osaka Press, Ltd, Kobe , 283 pp. Saris and his voyage to Japan are discussed by Cyril Wild at pages 102 to 124. The actual Saris log is at pages 124 to 232. More information here. A General History and Collection of Voyages and Travels, Forming a Complete History of the Origin and Progress of Navigation, History, and Commerce, by Sea and Land, from the Earliest Ages to the Present Time, Volume IX (1611-1701), edited by Robert Kerr, Edinburgh, printed by James Ballantyne for William Blackwood, 1813, 8vo, 562 pp. More information here. India Office Manuscript Supplemented With Extracts from the Hakluyt Society Manuscript - edited and supplemented by Ernest Satow. The India Office log is an original Saris's manuscript version of his log. 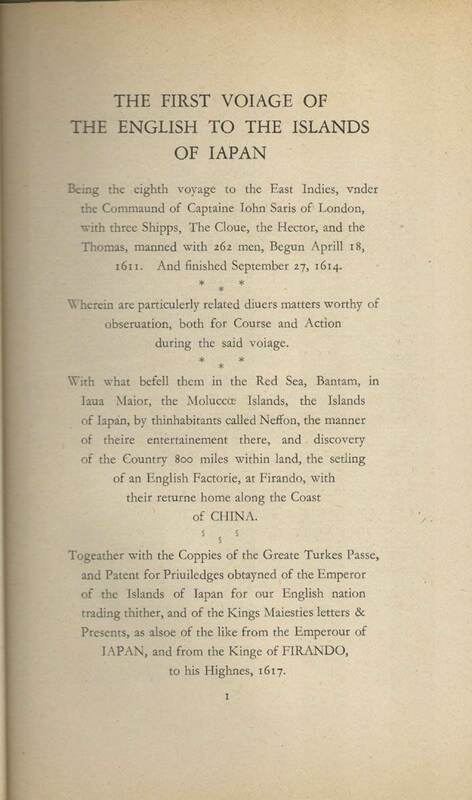 The Voyage of Captain John Saris to Japan, 1613, Edited from Contemporary Records by Sir Ernest M. Satow, K.C.M.G, from "Works Issued by the Hakluyt Society, Second Series, No. 5," London, Hakluyt Society, 1900, 8vo, gilt decorated and blindstamped blue cloth, frontispiece, 4 black and white plates (one of which is folding), folding map of the Eastern Seas, 20 pages of Hakluyt Society information, 242 pp. Satow based this book on a copy of the Saris manuscript preserved in the India Office and supplemented that with extracts from the Hakluyt Society Purchas His Pilgrims. More information here. 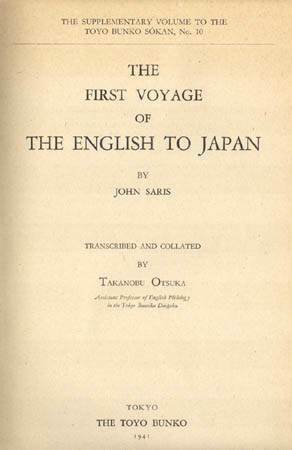 The Saris voyage of 1613 is generally described as the first "English" voyage to Japan. Will Adams, an Englishman, arrived in Japan in 1600 but as a crew member of a Dutch ship and subsequently represented the interests of Dutch East India Company.